Divertimento in B-Flat composed by Wolfgang Amadeus Mozart (1756-1791). Arranged by Simeon Bellison. For Clarinet. 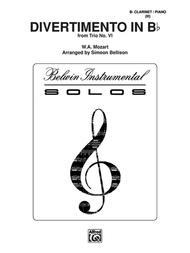 Masterworks; Solo; Woodwind - B-Flat Clarinet Solo. Masterwork Arrangement. Grade 2. Part(s). 8 pages. Published by Alfred Music (AP.FCS01415).List/syllabus: TX UIL PML: Band, Winds, Perc.